If music be the food of love, play a kickin’ 80s soundtrack. 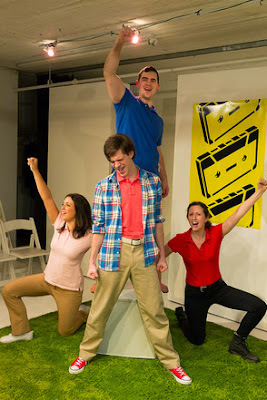 Taking inspiration from William Shakespeare’s Twelfth Night, among a few other titles, Pull Together Productions presents Sean Graney’s Twelve Nights, a jam-packed, high-energy, four person retelling of gender-bending love and miscommunications all with an obsession for mixtapes. With an 80s inspired text, Twelve Nights takes a condensed look at The Duke and Viola and their pals in Illyria as a madcap love triangle causes a domino effect of slapstick. Written by Sean Graney, Twelve Nights is a grin-inducing comedy that is a nice spin on the classic. Graney uses only four actors, two guys and two girls, to take on the various parts, breaking the gender walls throughout. Though Viola is usually played by a girl playing a boy, Twelve Nights has a boy playing a girl playing a boy. Don’t worry, it will take you a moment to figure it out while you’re watching. Graney’s text is witty and fun, borrowing moments from the Bard and throwing in recurring gags throughout the piece. One bit that Graney uses is to have each actor blatantly announce who they are playing in the moment or announce their scene partner in bold form. While it helps the audience follow along, a great knowledge of the source material is incredibly necessary. The foursome of actors do a great job at keeping the action moving and the comedy non-stop. David Andrew Laws and Robin Rightmyer have a natural comedic chemistry that exudes hilarity on the stage. As Viola and The Duke respectively, Laws and Rightmyer easily develop a fun relationship with one another. Laws, who also showcases his divine vocals, does an exquisite job honoring both the source and Graney’s world. Playing Olivia, among others, Amanda Tudor tackles spoiled brat head on. Tudor naturally eases into the love triangle just enough to hate her for getting in the way. Jane May’s track was filled with vulgarity through character, bringing a different style of comedy to the fold. Though funny, May seemed to have a more trouble fitting into the mix. Often playing an assortment of guys, her characters were more caricature than her counterparts. Director Brian Gillespie does a nice job exploring the fun of Graney’s script. Though there were subtle clues through props, music, and references, knowing that the play was supposed to take place in the 80s was lost. It seemed more like a quartet of people who just happened to like the 80s. The colorful set against the blank white room of the Theaterlab allowed for a nice splash of interest, but lighting designer Samantha Davis rarely theatricalized the space to give it the extra spark it desired. The costumes the troop wore seemed very much like a uniform as each actor's costume included a different color polo top. Though it could have been a script thing, Gillespie did not have his troop had pieces to their costume to differentiate their characters, forcing you to pay close attention to those name announcements. On the whole, Twelve Nights is a good old-fashioned fun night of theater with a little something missing. With an accompanying drinking game inspired by Christmas related phrases, Twelve Nights will surely make you smile from ear to ear.